Add a sophisticated finish to your style with these stylish cufflinks. These curved and textured cufflinks are set in a gunmetal grey colour with a side strip of polished silver toned metal for a chic look. 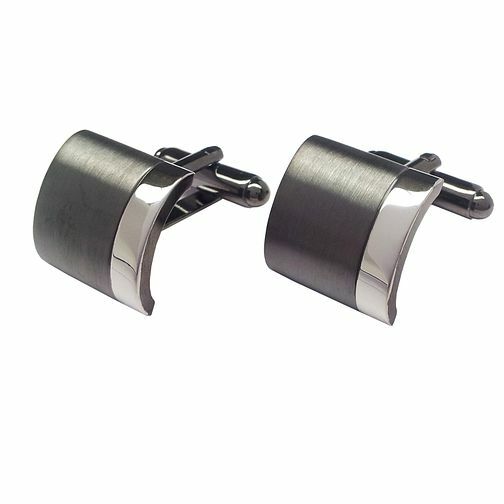 Gunmetal Grey & Rhodium Plated Curved Cufflinks is rated 4.5 out of 5 by 2. Rated 5 out of 5 by Anonymous from Very smart looking cuff links Good quality and very smart. Perfect for anyone who wears shirts to the office or for special occasions. Bought them in sale so delighted. Rapid despatch and I was kept informed of delivery details. Thank you. Rated 4 out of 5 by Anonymous from Modern looking cufflinks Purchased these cufflinks as a 40th birthday gift. Suitable for modern gent. Great looking & colour.